What is social about social software? Before we forget all about the label Social Software and move on to Web 2.0, 3.0, or whatever comes next, I think it would be useful to dwell a little bit on the use of the word ‘social’ as applied in this term. What does it mean for software to be social? Intuitively, we know that Social Software is software that fulfills some sort of social function, allowing us to form social connections, and perform social activities that give shape to social groups. But as evidenced by the number of times I just used the word ‘social’ to define Social Software, it is clear that what we have here is a tautology: by taking for granted what we understand by ‘social,’ the adjective in question both provides an absolute definition and at the same time manages to define nothing. This point became increasingly clear while I was reading Bruno Latour’s latest book, Reassembling the social: An introduction to actor-network-theory (2005, Oxford University Press). 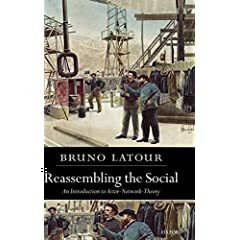 Latour is critical of the way in which the concept of the social has become a sort of “black box” which we use, perhaps out of laziness, to bracket all sorts of connections that should be explored in more detail. His goal in this introduction to ANT (actor-network theory) is therefore to “redefine the notion of social by going back to its original meaning and making it able to trace connections again” (p. 1). Actors are constantly on the move, ‘networking’ with other actors, creating associations. One of the main precepts of ANT is to get off the soap box of the know-it-all theorist and follow the actors, “grant them back the ability to make up their own theories of what the social is made of” (p. 11). In the context of ANT, the social is defined not as “a special domain, a specific realm, or a particular sort of thing,” such as Social Software, “but only as a very peculiar moment of re-association and reassembling” (p. 7). This is directly in opposition to the kind of normative critiques that assume a singular model of what the social should look like. For instance, new technologies are often condemned because they are seen as somehow corrupting The Social (for more on this, see my draft on Social Agency). These critiques rarely specify the composition of the social (it is enough to conjure up the term), but nonetheless they lament any attempt to redefine it. According to Latour, those who treat the social as a black box “have simply confused what they should explain with the explanation. They begin with society or other social aggregates, whereas one should end with them” (p. 8). In other words, one should not take social aggregates as points of departure, but as what needs to be explained in the first place. Unfortunately, by sticking the word social in front of the word software, we tend to revert to a social determinism in which it is assumed that the software does the bidding of something called The Social, something no longer in need of explanation, so that instead we can focus on what ‘cool’ things the software can do. Latour describes three steps which are treated in each part of the book: deployment, stabilization, and composition: “We first have to learn how to deploy controversies so as to gauge the number of new participants in any future assemblage (Part I); then we have to be able to follow how the actors themselves stabilize those uncertainties by building formats, standards, and metrologics (Part II); and finally, we want to see how the assemblages thus gathered can renew our sense of being in the same collective” (p. 249). In short, the goal is to be able to notice new actors and new arrangements of actors, to be able to trace the connections between those actors and the local and the global (“in spite of so much ‘globalonney’, globalization circulates along minuscule rails resulting in some glorified form of provincialism” p . 190), and to be able to ask the following question: how do we end up with a shared definition of a common world, a world to be shared among all the actors? As I try to show in my own work, the social is indeed something that keeps referring us back to the virtual. This was equally true for so-called ‘primitive human,’ who relied on non-human artifacts to keep virtual ancestors part of her social assemblages, as well as for so-called ‘modern human,’ who relies on software objects to keep virtual contemporaries part of her social assemblages. The power of Social Software lies in its ability to render apparent the complex, arduous and never ending work of building sociality, of actualizing the virtual, as Deleuze would say. The trick is to walk slowly, like an ANT. This entry was posted in collaboration and technology and tagged Bruno Latour, networks, social media, virtuality on January 21, 2006 by ulises. Here’s our take on news that matters for Monday, January 23. Today’s theme is conforming and here are a some links to headlines about technology that is changing the way we live and learn. ¿Qué es el Social Software?